essays, on every aspect of fishkeeping, particularly husbandry and breeding. photos and format them, to put them up here and available to better inform your choice to keep these fish. publications. If anyone would like to use one of these in a club publication, simply email me. This is an introduction to the Select Aquatics Fisroom. used to breed these fish in larger numbers is discussed. occasional death of fish is discussed. ship various species sold here. more in depth look at Box Filters! This is the first video I did on the Fishroom over 5 years ago. are kept, and most of the fish are unchanged! 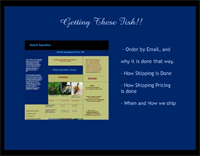 "I'm New To these Fish"
to tank maintenance, Foods, Live Foods, then distributing your fish to other hobbyists. understanding of appropriate fish care and husbandry. become well known and understood from the time a tank is first set up through its day to day maintenance. article is a must read for those considering keeping and breeding most any type of aquarium fish. the fish will go through, and that you should be aware of before they will reach their potential in your tank. This documents how to construct an automatic water change system that requires no drilling of tanks and no pumps. this fishroom of 120 tanks for about 10 years. Tank placement, metal vs. wood racks, temperature, light, air and electrical issues are addressed. medications, what to do when something first appears, and the basic medications that you should keep on hand. factors, myths, and the husbandry practices that get the most size and best overall health from your fish. 13 pages. sexing the Goodeids and other livebearers. will eat their fry, which won't, and how best to manipulate the birthing process so that few are preyed upon. of fish are covered, including breeding myths and misconceptions. explain an approach that others can use to increase the numbers of these rarer fish in the hobby. This species results in more letters from customers as to how to breed them more than any other species here. prolific and can be bred into a peaceful schooling group fairly easily! here. No longer carried by Select Aquatics, this documents the development f a new strain through Select Breeding. raising of fry are covered. they do well. There is a reason you do not see them offered routinely at local fish meetings and on the internet. Though not difficult to keep, a few things must be done for them to thrive and breed consistently. own tanks and raised normally. Many tricks have been discovered to increase yield and keep the new fry doing well, all that are described here. help as much as my time allows. is inexpensive and can be done by anyone with the proper bags and box. at this website. I do cover blackworms and other types of live foods in greater depth. big deal when it is done right. single tank, or a few tanks across town. 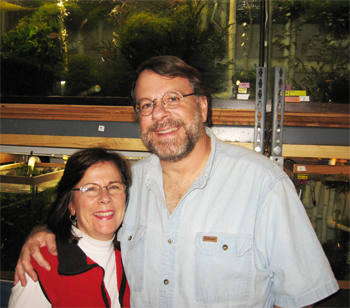 in the hobby, but has always maintained a few tanks of livebearers. new Cavalalier King Charles puppy, Ripley.